Cells, which were once invisible to the naked eye, were first seen in 17th century Europe with the invention of the compound microscope. Robert Hooke was the first person to term the building block of all living organisms as "cells" after looking at cork. The cell theory states that all living things are made up of cells. The theory also states that both plants and animals are composed of cells which was confirmed by plant scientist, Matthias Schleiden and animal scientist, Theodor Schwann in 1839. 19 years later, Rudolf Virchow contributed to the cell theory, arguing that all cells come from the division of preexisting cells. In recent years, there have been many studies which question the cell theory. Scientists have struggled to decide whether viruses are alive or not. Viruses lack common characteristics of a living cell, such as membranes, cell organelles, and the ability to reproduce by themselves. Viruses range from 0.005 to 0.03 micrometers in size whereas bacteria range from 1-5 micrometers. Modern day cell biology research looks at different ways to culture and manipulate cells outside of a living body to further research in human anatomy and physiology, to derive treatments and other medications, etc. The techniques by which cells are studied have evolved. Advancement in microscopic techniques and technology such as fluorescence microscopy, phase-contrast microscopy, dark field microscopy, confocal microscopy, cytometry, transmission electron microscopy, etc. have allowed scientists to get a better idea of the structure of cells. There are two fundamental classifications of cells: prokaryotes and eukaryotes. The major difference between the two is the presence or absence of organelles. Other factors such as size, the way in which they reproduce, and the number of cells distinguish them from one another. Eukaryotic cells include animal, plant, fungi, and protozoa cells which all have a nucleus enclosed by a membrane, with various shapes and sizes. Prokaryotic cells, lacking an enclosed nucleus, include bacteria and archaea. Prokaryotic cells are much smaller than eukaryotic cells, making prokaryotic cells the smallest form of life. Cytologists typically focus on eukaryotic cells whereas prokaryotic cells are the focus of microbiologists, but this is not always the case. The study of the cell is done on a molecular level; however, most of the processes within the cell are made up of a mixture of small organic molecules, inorganic ions, hormones, and water. Approximately 75-85% of the cell's volume is due to water making it an indispensable solvent as a result of its polarity and structure. These molecules within the cell, which operate as substrates, provide a suitable environment for the cell to carry out metabolic reactions and signalling. The cell shape varies among the different types of organisms, and are thus then classified into two categories: eukaryotes and prokaryotes. In the case of eukaryotic cells - which are made up of animal, plant, fungi, and protozoa cells - the shapes are generally round and spherical or oval while for prokaryotic cells – which are composed of bacteria and archaea - the shapes are: spherical (cocci), rods (bacillus), curved (vibrio), and spirals (spirochetes). Cell biology focuses more on the study of eukaryotic cells, and their signalling pathways, rather than on prokaryotes which is covered under microbiology. The main constituents of the general molecular composition of the cell includes: proteins and lipids which are either free flowing or membrane bound, along with different internal compartments known as organelles. This environment of the cell is made up of hydrophilic and hydrophobic regions which allows for the exchange of the above-mentioned molecules and ions. The hydrophilic regions of the cell are mainly on the inside and outside of the cell, while the hydrophobic regions are within the phospholipid bilayer of the cell membrane. The cell membrane consists of lipids and proteins which accounts for its hydrophobicity as a result of being non-polar substances. Therefore, in order for these molecules to participate in reactions, within the cell, they need to be able to cross this membrane layer to get into the cell. They accomplish this process of gaining access to the cell via: osmotic pressure, diffusion, concentration gradients, and membrane channels. Inside of the cell are extensive internal sub-cellular membrane-bounded compartments called organelles. Cells contain specialized sub-cellular compartments including cell membrane, cytoplasm,mitochondria, and ribosomes. See organelle. The growth process of the cell does not refer to the size of the cell, but instead the density of the number of cells present in the organism at a given time. Cell growth pertains to the increase in the number of cells present in an organism as it grows and develops; as the organism gets larger so too does the number of cells present. Cells are the foundation of all organisms, they are the fundamental unit of life. The growth and development of the cell are essential for the maintenance of the host, and survival of the organisms. For this process the cell goes through the steps of the cell cycle and development which involves cell growth, DNA replication, cell division, regeneration, specialization, and cell death. The cell cycle is divided into four distinct phases, G1, S, G2, and M. The G phases – which is the cell growth phase - makes up approximately 95% of the cycle. The proliferation of cells is instigated by progenitors, the cells then differentiate to become specialized, where specialized cells of the same type aggregate to form tissues, then organs and ultimately systems. The G phases along with the S phase – DNA replication, damage and repair - are considered to be the interphase portion of the cycle. While the M phase (mitosis and cytokinesis) is the cell division portion of the cycle. The cell cycle is regulated by a series of signalling factors and complexes such as cyclin-dependent kinases and p53, to name a few. When the cell has completed its growth process, and if it is found to be damaged or altered, it undergoes cell death, either by apoptosis or necrosis, in order to eliminate the threat it can cause to the organism's survival. Active transport and Passive transport - Movement of molecules into and out of cells. Autophagy - The process whereby cells "eat" their own internal components or microbial invaders. Adhesion - Holding together cells and tissues. Cell movement - Chemotaxis, contraction, cilia and flagella. Cell signaling - Regulation of cell behavior by signals from outside. DNA repair - Cell death and cell senescence. Metabolism - Glycolysis, respiration, photosynthesis, and chemosynthesis. Signalling - The process by which the activities in the cell are regulated. Transcription and mRNA splicing - Gene expression. 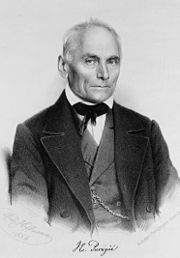 Czech anatomist Jan Evangelista Purkyně is best known for his 1837 discovery of Purkinje cells. Wikimedia Commons has media related to Cell biology. 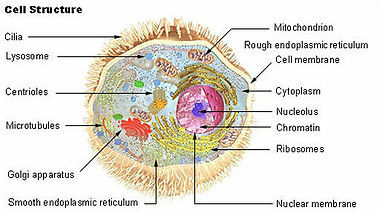 ^ "Cell Biology | Learn Science at Scitable". www.nature.com. Retrieved 10 June 2018. ^ Alberts, Bruce; Johnson, Alexander; Lewis, Julian; Raff, Martin; Roberts, Keith; Walter, Peter. Isolating, Cloning, and Sequencing DNA. Retrieved 31 December 2016. ^ Hooke, Robert (September 1665). Micrographia. ^ a b c Gupta, P. (1 December 2005). Cell and Molecular Biology. Rastogi Publications. p. 11. ISBN 978-8171338177. ^ Kendrick, Karolyn (1 January 2010). Chemistry in Medicine. Benchmark Education Company. p. 26. ISBN 978-1450928526. ^ Cullimore, D. (17 December 2007). Practical Manual of Groundwater Microbiology (2nd ed.). CRC Press. p. 117. ISBN 978-0849385315. ^ Lavanya, P. (1 December 2005). Cell and Molecular Biology. Rastogi Publications. p. 11. ISBN 978-8171338177. ^ Doble, Mukesh; Gummadi, Sathyanarayana N. (5 August 2010). Biochemical Engineering. New Delhi: Prentice-Hall of India Pvt.Ltd. ISBN 978-8120330528. ^ a b "The Morphology of Eukaryotic Cells: Shape, Number and Size". YourArticleLibrary.com: The Next Generation Library. 19 March 2014. Retrieved 22 November 2015. ^ Kaneshiro, Edna (2 May 2001). Cell Physiology Sourcebook: A Molecular Approach (3rd ed.). Academic Press. ISBN 978-0123877383. ^ a b c Lodish, Harvey (2013). Molecular Cell Biology. W. H. Freeman and Company. ISBN 978-1-4292-3413-9. ^ "The Size, Shape, And Arrangement of Bacterial Cells". classes.midlandstech.edu. Archived from the original on 9 August 2016. Retrieved 22 November 2015. ^ a b Hardin, Jeff (2012). Becker's World of the Cell. ISBN 978-0-321-71602-6.